Auburn-Florida State, BCS title game: Would the Auburn Tigers have won the national title if they had tried not to score at the end of the game? Would the Auburn Tigers have won the national title if they had tried not to score at the end of the game? 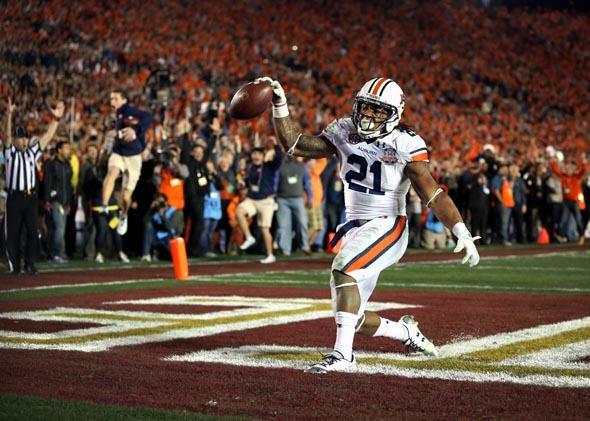 Should Tre Mason be celebrating? A bunch of people are asking a question that’s intriguing or insane, depending on your perspective:: What if Auburn running back Tre Mason had kneeled on the 1-yard line rather than score the go-ahead touchdown in the final minutes of college football’s BCS title game? Would a kneel down have given Auburn a better chance of winning than scoring a touchdown immediately and giving Florida State time to score in response? Following Mason’s kneel at the 1, the clock would be stopped for the first down until the ball is reset, as per college football rules. To prevent Auburn from burning another 25 seconds, Florida State would at this point use its first timeout. Let’s assume that Auburn snaps the ball on first down with 1:19 on the clock. Plays typically take six seconds. If Auburn does not score on first down, Florida State would use its last remaining timeout, and the second-down snap would come with 1:13 left in the game. If the Tigers don’t score on second down, they could burn 45 seconds before the next snap at 0:28. Auburn could use its own timeouts to ensure there is time for two more plays, a third down and then a fourth down that would likely coincide with the expiration of regulation time. But the problem with the kneel-down strategy is that it still allows Florida State a small chance of responding with its own drive. As opposed to the score-a-touchdown-or-else scenario, the Seminoles now have two ways to win: They can stop Auburn, or they can allow a touchdown and drive the field themselves. The chance of Florida State scoring dwindles as Auburn goes deeper into its series of downs, but it’s still a possibility. The math gets a little complicated, but cutting to the chase, I believe that Auburn’s overall chance of winning by taking a knee is lower—about 73 percent—than its win probability after scoring immediately. That doesn’t change much if the Tigers’ strategy is modified slightly and they decide to tie the game at the end of regulation with a field goal if they fail on the first three downs. That maneuver leaves them with about a 75 percent chance to win, still lower than had Mason simply scored the go-ahead touchdown at 1:19. Based on my assumptions, kneeling at the 1-yard line would not have been a good idea. The risks outweigh the rewards. However, those assumptions were very conservative with regard to the chance of scoring from the 1-yard line. If we increase the chance from 35 percent to 50 percent on any given play, which is not unrealistic, the kneel-then-score strategy gives Auburn an 82 percent chance of winning, equal to their actual chances after Mason’s touchdown. To get to a break-even point where kneeling makes sense, then, our assumptions would have to be optimistic. And keep in mind that penalties, turnovers, and the possibility of lost yardage were not factored into this analysis. Because the value of kneeling is in taking time off the clock, Auburn would have to be unsuccessful on its initial downs and then successful on third or fourth down to make the strategy worthwhile. But the deeper into the series the Tigers go, the more likely they’ll come up empty. In the end, this is the kind of brinkmanship that a coach who’s going for a national title—even one as unconventional as Gus Malzahn—would likely never engage in. The potential consequences are just too catastrophic.